We have a lot going on in Career Development Services (CDS) over the next several months, and we’re excited to share our upcoming events and activities! We know how daunting career preparation and the job search can be, so remember that the CDS team is always available as a resource. The CDS department has a variety of programs and services that can make all the difference in the career development of Peirce students and alumni. 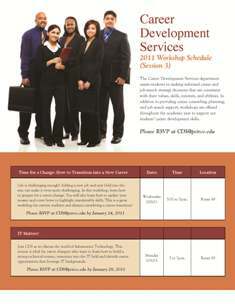 Click on the flyer below for the current 2011 CDS Workshop Schedule for January and February. You can RSVP to all events by calling 888.GO.PEIRCE, ext. 9202, or send us an e-mail. And remember, if the workshop you need is not available or if you can't attend one of the scheduled sessions, you can always contact CDS to make an appointment with a counselor for a one-on-one session. Whether you need help finding a job or simply want to get a head start in exploring different career paths, we have a variety of counseling and support services that cover everything from interviewing and resume writing assistance to an online job board for Peirce students and alumni, and a Co-op program.